Enjoy the beauty of the Trail and make a real difference by volunteering! Thanks to all the dedicated volunteers who in 2016 cumulatively donated 1,650 hours to remove invasive species, pick up litter, or help out at the Run/Walk. Volunteers play a huge role in making the Hank Aaron State Trail a reality and improving the neighborhoods which the Trail touches. The Friends of Hank Aaron State Trail, City of Milwaukee, and State of Wisconsin are grateful for the efforts of all the volunteers who have helped to date. The future of the Trail depends heavily on volunteers to help maintain and improve the Trail – we invite you to make a difference! Sign up on the Riverkeepers website or just show up! These efforts are making a real difference along the Trail and in the Menomonee River Valley. Main sign-in locations are at Miller Park (near Klement's Sausage Haus), Stormwater Park (across from Palermos Pizza) and at 68th and Dickenson St. We hope you'll join us each year to continue the good work! Many interested parties have worked hard to restore areas along the Trail with healthy waterways, abundant wildlife, and recreational greenspace. A multi-year assessment of the environmental conditions of the Valley was conducted by the City of Milwaukee, Menomonee Valley Partners, Wisconsin DNR, Environmental Protection Agency, and the US Geological Survey. The assessment led to an understanding of the existing conditions and what steps were necessary to redevelop and remediate the land and minimize further contamination. Stewardship "Stew Crews" are a great way for interested organizations, businesses, and neighborhood groups to care for their "own" section of trail. The flagship event on the Trail, the Hank Aaron State Trail 5K Run/Walk is the Friends of Hank Aaron State Trail's major fundraiser that supports efforts year round. More than 100 friendly volunteers share their time to create a memorable experience to keep runners and walkers coming back year after year! 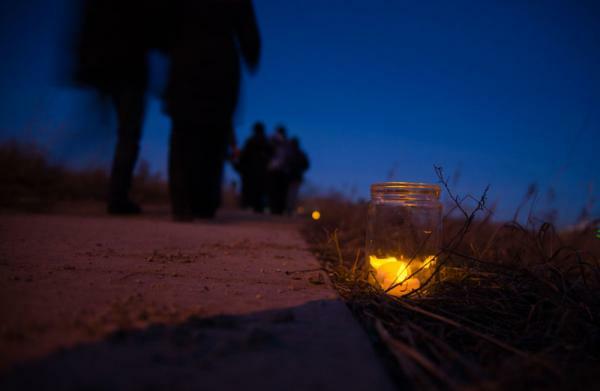 The Friends of Hank Aaron State Trail partners with the Urban Ecology Center and Menomonee Valley Partners to invite hundreds of people to enjoy two miles of candlelit trails each February. This event wouldn't be possible without volunteers! Please contact us for more information about volunteering.